Friday practice, (the one I paid extra for), was half over by the time I rolled into Mid-Ohio in my Joad family wagon. Vintage Motorcycle Days is a huge event, drawing tens of thousands of spectators over 3 days, as well as some of the best riders of classic machinery in the country. No sooner did I get the bike unloaded than the storm clouds gathered. Mid-Ohio is treacherous in the wet and I had no desire to practice in it, so I hurried to get out while it was still dry. That meant another night in the EZ Bake Snap On Oven. The borrowed generator I trucked all the way from NY was louder than a thousand train wrecks and still didn't have enough juice to run my borrowed air conditioner. I lay there melting into the foam mattress and in the moments I was not kept awake by thought induced insomnia, I dreamed the dreams of the insane, restless and feverish. 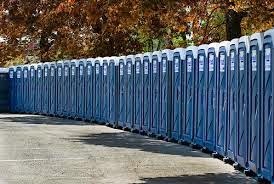 Morning brought new pleasures, namely having to utilize the Porta-Potty facilities at the top of the paddock. Heat radiated off the upright plastic sarcophagi like a crematorium. You keep telling yourself not to look down, because if you don't look down it's not as bad, while trying to hold every stitch of clothing off the floor because the dirty lout before you was nice enough to mark it his territory and your shoes are sticking. I was sweating so bad that I feared slipping between the toilet seat and dying a vile blue chemical and crap soup death at the bottom of that pit of filth. After using the last three scraps of toilet paper and realizing there isn't enough foamy hand sanitizer in the world that can make you feel clean again, you stumble back onto the pavement gasping for air and make your way to the showers, now a carrier for cholera and dysentery. A group shower to be precise, just like high school, and prison, but dirtier and with even worse plumbing. One shower-head sprays a jet so sharp it threatens to circumcise you again, while the others are merely a dribble, I think the sweat is actually running out of my pores quicker. I lather quickly and rinse, knowing I have now picked up athlete's foot, ringworm and probably herpes. By the time I am dressed again I feel worse than before I showered. I wonder how a national caliber racetrack like Mid-Ohio gets by with such sub-standard restroom facilities, I also wonder if it is too late to take up golf.